It's a Mom Thing Reviews & More! : Teleflora Mother's Day Bouquet Giveaway! 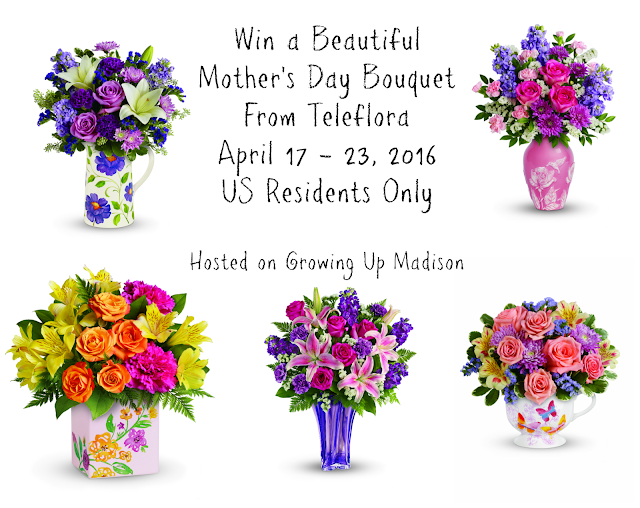 Teleflora Mother's Day Bouquet Giveaway! Mother's Day is quickly approaching and no one ever said motherhood was easy. It’s a tough, gritty, no-pain-no-gain job that takes strength, courage and a whole lot of love. A mother’s perseverance is inspiring to say the least. Yes, motherhood is a struggle, but through all the difficulty comes reward – an endless supply. Motherhood isn’t always hearts and roses. Mother’s Day can be with Teleflora. Teleflora’s campaign, “One Tough Mother,” would like to honor all Moms with flowers this Mother’s Day because they work a 24 hour 7 day a week job that’s incredibly rewarding but also tough. Each of these gorgeous Mother’s Day bouquets are professionally-arranged and hand-delivered by a local florist with love and care to capture the hearts and appreciation of every mother, grandmother, aunt, sister or friend. Teleflora would love for one of you to win a beautiful bouquet to honor your mother. Prize is sponsored and will be delivered by Teleflora. The winner will have 48hrs to respond to the winning email. Failure to do so will mean forfeiting your prize and a new winner will be chosen. Good luck! A nice brunch, a hike, and watching the kids play soccer. Taking my mom out for a nice brunch and spend the day at the park! Hey, I am so glad to know about Teleflora Mother's Day Bouquet Giveaway. All these flowers shown in these pictures look amazing. My fiancé is in Los Angles and I want to send her flower bouquet through BloomThat Flower Delivery. If you have reviews about this online flower shop then please let me know.